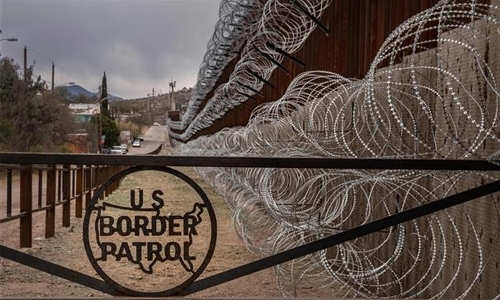 President Donald Trump takes his politically explosive push for walling off the Mexican border to the frontier city of El Paso yesterday, four days before a deadline for Congress to meet his demands. According to Trump, illegal immigrants pose a national security risk to the United States and can only be stopped by dramatic extensions of current barriers. Trump chose El Paso as a historic crossing point where, he says, walls have eradicated an out-of-control influx of criminals from Mexico and made the city a model for what could happen elsewhere on the border. But there’ll be a counter-message a short distance from where Trump speaks when rising Democratic star Beto O’Rourke -- a possible challenger to Trump in 2020 -- holds his own rally. A former congressman who excited grassroots Democrats last November with an againstthe-odds near upset of Republican Senator Ted Cruz, O’Rourke is from El Paso. “While some try to stoke fear and paranoia, to spread lies and a false narrative about the US-Mexico border and to demand a 2,000 mile wall along it at a time of record safety and security, El Paso will come together for a march and celebration that highlights the truth,” O’Rourke’s office said.